Two Fridays ago I was invited to a birthday party. My superdear friend Sif was going to celebrate her birthday. Last year I gave her a shoulderette that she really liked (luckily because I didn't know which were her favorite colors so I just chose one that I thought she could like... and that I really liked myself when I saw it hanging in my LYS). Echo Flower. 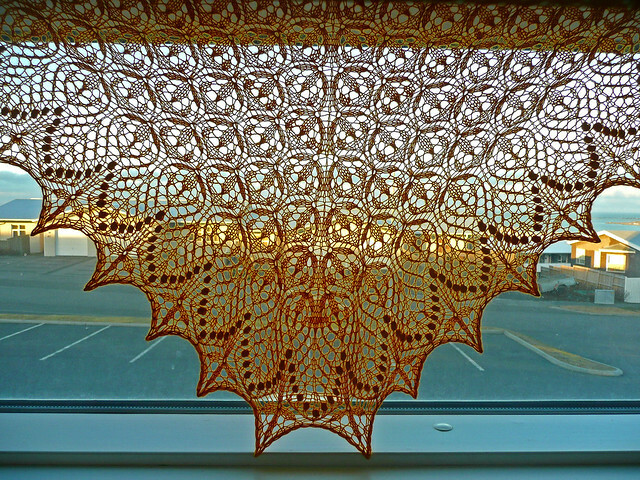 Yarn: Malabrigo lace. This year, I didn't have enough time to prepare a present like a shawl or anything bigger so I had to think fast and come up with something quick because I think that hand made presents are always the best thing that one can receive. I had only two days to make something. 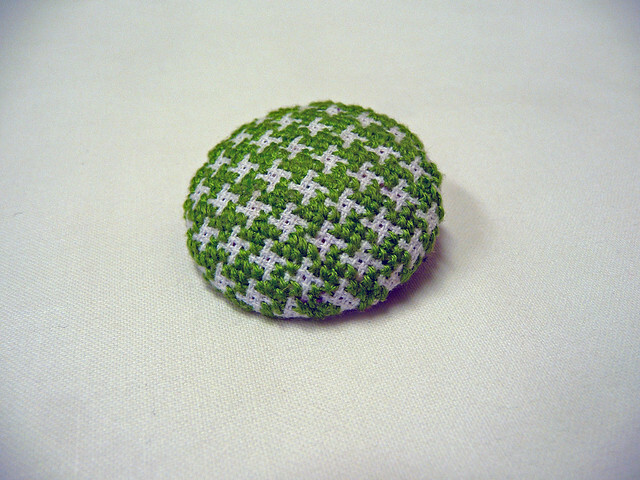 So I went for a hand made pin (or brooch). This time I didn't knit it. I used cross stitch and my favorite pattern: Houndstooth. It is a very quick, easy and good looking thing to make. 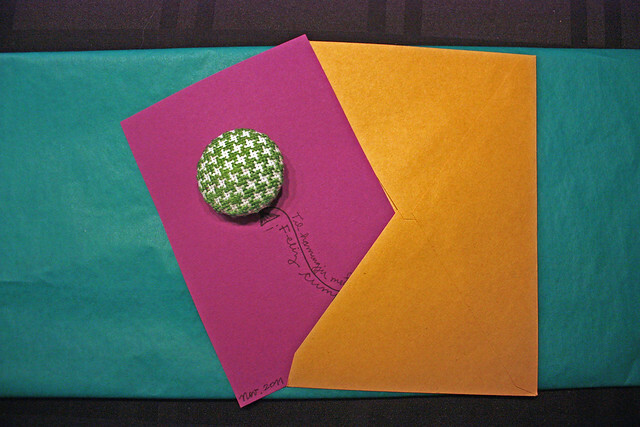 Then I attached it to a card and put it in an envelope. Along with the brooch I gave her a book. I went to the University Bookstore where they have a little collection of books in spanish (yes, Sif speaks spanish BEAUTIFULLY!) and among those there were a few books from Chilean authors. I gave her one my favorite books: La amortajada, written by María Luisa Bombal. (I also found another of my favorites: Rimas y leyendas by Gustavo Adolfo Bécquer, I HAVE to get it for myself!). During the weekend I finally got some pictures taken of me wearing Þröstur. The days are getting shorter and shorter around here and one thing I like about that is that everytime that is not cloudy the short hours of light we have are beautiful. There is a certain softness in it that lightens everything up in the most beautiful way. Saturday was like that. So we took a walk to the pond that is right behind our neighborhood (for those who don't know the place where I live is completely built on lava, there are not many trees but it is really pretty to walk around). It was so quite, almost no wind at all. I also want to share a few pictures I took with the film camera that Judi generously sent me (along with other treasures). 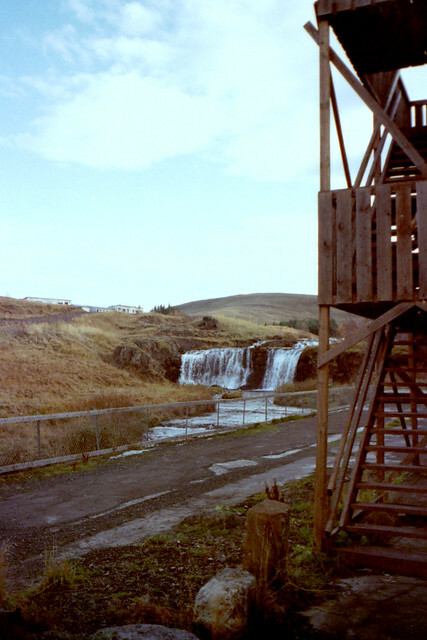 These pictures are from Álafoss, the place where Lopi is produced and sold. It is a really nice place. 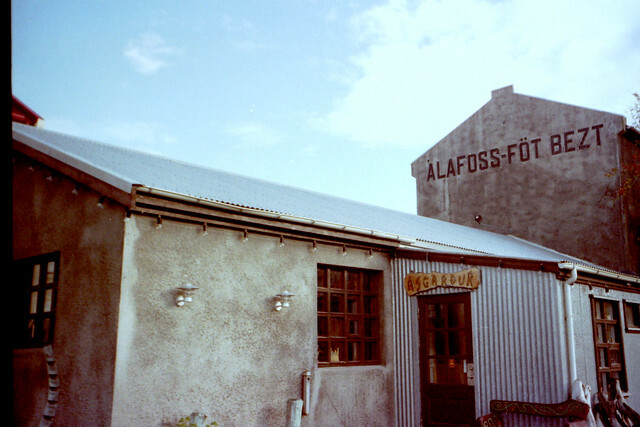 Even though it is possible to buy lopi everywhere, even in the supermarket, I always choose to drive to Álafoss. And it is not only that the place is cool but the people working there is just adorable! This is the building where the shop is. 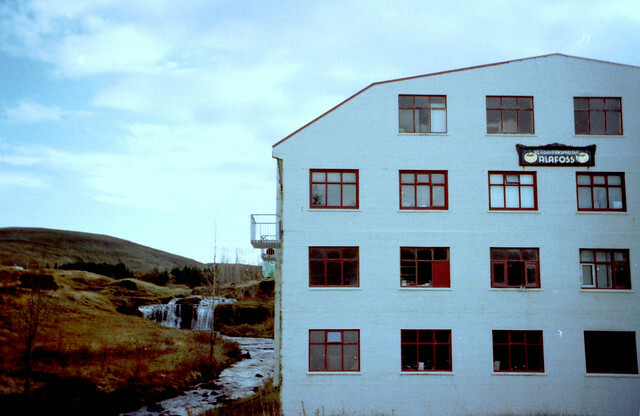 There are several old buildings: the wool shop, some workshops, a café and the recording studio of Sigur Rós. 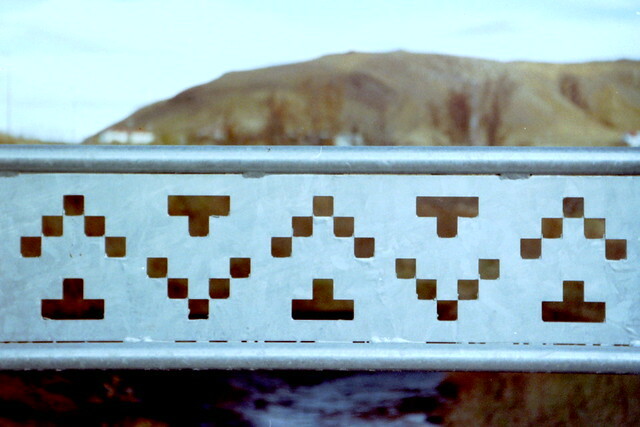 Detail of the bridge over the little river. Everything is "stitch-related". Cute, isn't it? 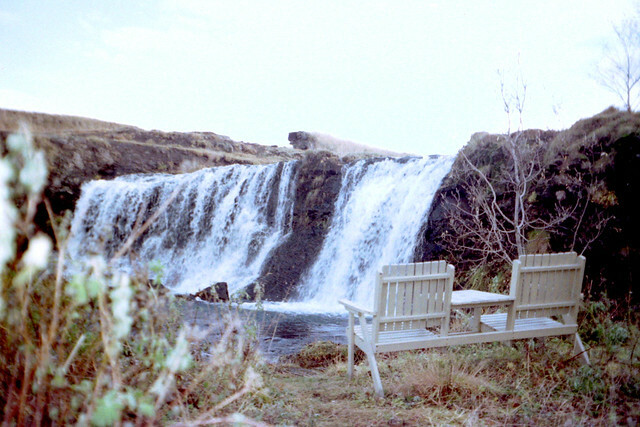 I have been going to buy lopi to Álafoss for almost three years and I had NEVER seen the waterfall until now!! How silly is that! 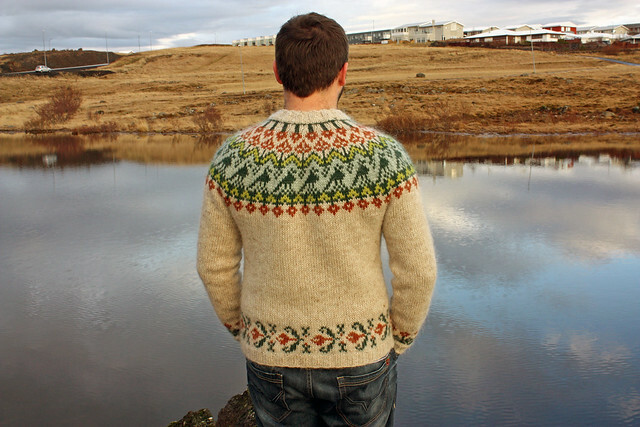 Your lovely Lopapeysa (I hope that is the right word) looks fabulous on you. I just love it - so fresh and interesting. Well done. :) ohhhh.. pero que chulo quedó el suéter! !1 y el chal.. ahhhhhggg!!! jajaja,,, justo ayer pasé or acá,, checando los detalles técnicos del aeolian,, ¡¡ hice 4 yucca!!! y como que no me cuadra el trancision chart :S jaja así que vine a ver si me iluminaba un poco :) ... las fotos hermosas,, tienes buen ojo!! no sé si eres profesional.. pero me encantan! !1 salitos desde acá!!! Peysan fer þér svoooo vel og er svo dásamlega falleg! Til hamingju með hana aftur! Nælan er líka algjört krútt! Rodrigooooooooooooooo, el broche me encanta pero es que el jersei me tiene fascinada!!! Ale: Estoy feliz con el sweater! Cuéntame si necesitas ayuda con el Aeolian! Seguro que te va a quedar muy bonito! El broche precioso, el lopapeysa comentado en Ravelry pero el Echo flower lo tengo pendiente desde que vi el de Alex. Que nº de agujas usaste y cuantos gramos de lana ???? el regalo: precioso! Sif estará feliz de tener un amigo como tu! y adoro tu jersey! es un diseño precioso!